The High Altitude Mindset is an interconnected constellation of capabilities and behaviors that support a leader in effectively engaging with the most challenging environments. It is the heart and foundation of the Adaptive Organization. The Adaptive Leader’s responsibility is to demonstrate capacity in these six domains and foster their cultivation in every member of the team and ultimately throughout the organization. The Mindset is built out of experience. An individual’s mindset is fundamentally an expression of character, which is constructed, bit by bit, out of the choices we make in the challenging moments of our lives. Every “character-building experience” we have contributes to the person we are always becoming. 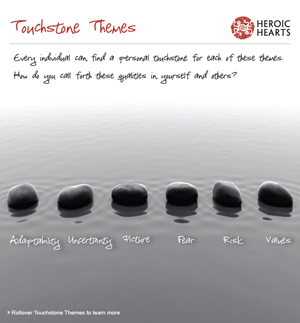 The touchstones are used to connect individuals and teams to the inner capacities and qualities they need to succeed. They form the basis for a kind of practice of elevating self and others to a superlative level of performance by reconnecting with past personal experiences or iconic, inspirational stories of others. So we believe it is crucial for Adaptive Leaders to develop their own set of touchstones, especially on these six themes that we have identified as essential in this volatile environment.